Go here to see my previous posts on this issue. All of this violence is to control routes into the U.S. for human and drug trafficking. So as you read these posts ask yourself: Why would anyone deem it in the public interest to designate Wilderness in close proximity to our southern border? Why limit the use of motorized vehicles and mechanical equipment by federal, state and local law enforcement on over 400 square miles of southern NM? This series is followed by two additional posts: One about Salazar visiting a wilderness area thoroughly destroyed by illegal trafficking and the other is two video reports where you can actually hear the 911 calls from our citizens on a violent event and the other where you can hear the officers on our side of the border reporting on the event. It's really a shame I'm having to post about this at all. Photos released of Mexican helicopter flying over Falcon HeightsAuthorities have released photos showing a Mexican military helicopter flying on the American side of the border. 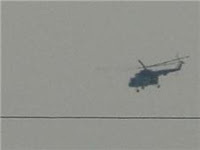 Zapata County Sheriff Sigifredo “Sigi” Gonzalez said the photos and eyewitness accounts prove helicopter flew unauthorized into American airspace on Tuesday evening. The alleged incursion happened near Falcon Dam in the rural community of Falcon Heights. Witnesses said the chopper had the Mexican navy logo, armed men inside and the cargo ramp down. The chopper reportedly spent at least 15 minutes in the area before crossing back into Mexico. Immigrants Returned Through Presidio to Avoid Violence Beginning today illegal immigrants who are eligible to voluntarily return to Mexico will now go through the Presidio port of entry, instead of El Paso. Border patrol officials hope to prevent the Mexican citizens from being subjected to the violence in Juarez and surrounding areas. Once a day, everyday of the week, a bus will travel from El Paso to Presidio to carry the Mexican citizens who have requested voluntary return to Mexico. Officials say this modified program began today and will continue indefinitely to help reduce the risk for Mexican nationals. COMMENT: It's not safe enough to return the illegal immigrants but it is safe enough to create a 400 square mile zone where law enforcement may not enter?